Our practice is working in conjunction with Midlothian Health and Social Care Partnership to improve our services for our patients. The partnership has been formed between NHS Lothian and Midlothian Council. 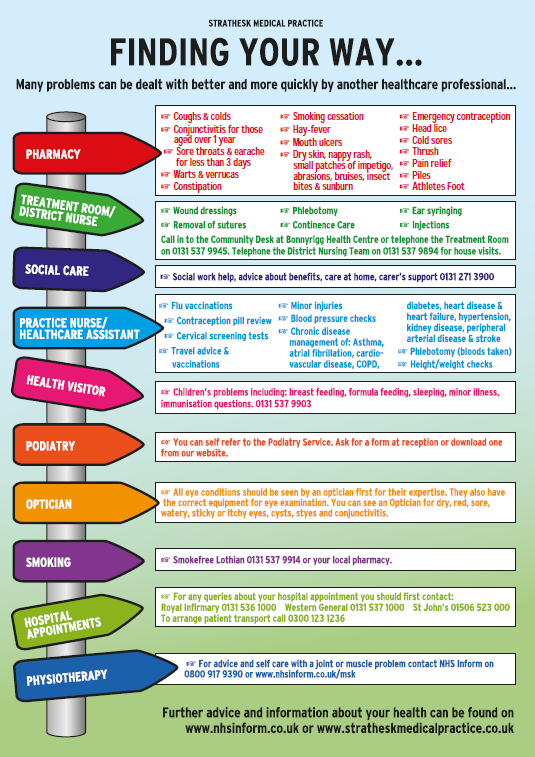 Part of this initiative is that our practice now offers a signposting service. Signposting means that whenever you contact the practice for assistance the receptionist will ask you for some details regarding why you are telephoning the practice. All of our reception staff have received signposting training and are able to book you appointments with suitable clinicians in the practice but can also advise when another service will be more suitable for you, i.e. they can signpost you to who can best help. We encourage all of our patients to learn more about signposting and encourage our patients to choose the most suitable service to assist them - however we are always available at the other end of the phone and at our reception desk to advise you if you are at all unsure how to proceed. This page includes information guidance on who to see or speak to for a variety of services available to you locally. If you would like to print out your own copy of this Finding Your Way Poster, please click here. Midlothian Health and Social Care Partnership have created a booklet - 'Do I need to see a GP? ', which you may find helpful. You can pick up a copy of the booklet from our practice, or download your own copy by clicking here. Many local pharmacies run a Pharmacy First service. They are able to prescribe treatment for impetigo, and for urinary tract infections in women aged 16 to 65. Your local optician should be your first port of call for any eye problem - all appointments are NHS funded. Click here to learn more and find optician contact details. Our practice now offers physiotherapy appointments for people with a muscle, bone or joint problem, and you can book these directly. Click here to read more about this service. You can also phone the Musculoskeletal Helpline on 0800 917 9390 (9.00am to 5.00pm, Monday to Friday) for help with problems such as back ache. Read more here. There are many excellent local sexual health services available for self referral, including STI testing, contraception, vasectomy and termination of pregnancy - please read more on our Sexual Health page. On the day HIV testing is available from Waverley Care at 3 Mansfield Place, Edinburgh, tel 0131 558 1425. Waverley Care can also test you for Hepatitis B and Hepatitis C - results are not available on the day, but they will arrange that you receive your results as soon as they are available. Click here for details. If you are looking for information regarding cancer screening and why you should take part when invited, please visit the getcheckedearly.org website. Hayfever advice - please click here to read about how to self care, and advice on when you should seek medical help.